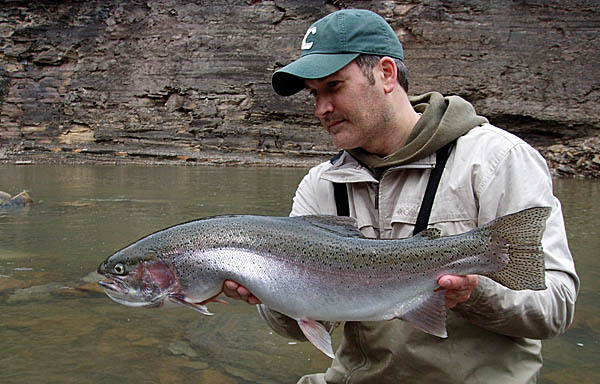 With so few fishing trips in 2012, just getting out was a reward in itself. Add the fact that it was 60 degrees on December 16th, and I was having a great day before I even casted. The water of choice today was the Vermilion River near Mill Hollow-Bacon Woods Park. For it being such a nice weekend day, I was surprised that only a moderate number of anglers were out. Overall, the fishing was slow, but I always say it only takes one bite to change everything. After quite a few hours of fishing, my one bite was the pictured Steelhead that hit on a fresh spawn sac drifted under a bobber. I owe some gratitude to the stranger last week who game me the eggs. A very nice gentleman that said he wasn’t going to be able to use them before they went bad. I guess I had good timing as I wasn’t even fishing that day, just had pulled up to chit chat with other anglers. Anyways, I was happy to put his kind gesture to good use!